When John Sinclair opened his drug store in 1960 it was based on the founding principle of providing personal service and friendly advice. The importance of customer service continues to be a driving force behind Sinclair Pharmacy. 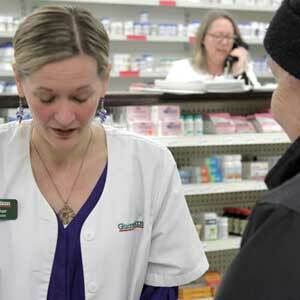 Our friendly staff and pharmacists are always available to give you a helping hand. As a small store we offer everything you need without pushing what you don’t need. Customers can easily find what they are looking for in the modest four-aisles of health care & beauty products. The Sinclair pharmacy team enjoys getting to know you and your family and are happy to help you find the answers to your health concerns. As a Guardian Pharmacy we are independently owned by Stratford and area pharmacists who are also members of McKesson Canada, Canada’s oldest and largest independent pharmacy services provider. Being a part of the Guardian network allows us to provide our unique pharmacy and health care services plus offer the Guardian brands and promotions. We are happy to hear from you. Meet our team.